The Metropolitan Museum of Art, in New York City, is one of the world's largest and most comprehensive art museums. The Met's collection includes other two million objects, spanning over 2000 years of history and covering virtually every corner of the globe. An average of 17,000 people visit the museum each and every day. 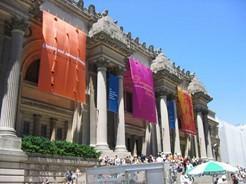 The Metropolitan Museum of Art was first opened in 1870, in a smallish townhouse on Fifth Avenue. The original collection included just 174 paintings - mostly Dutch Masters with a few European paintings - and one Egyptian sarcophagus, donated by railroad tycoon, John Taylor Johnson. The museum's collection grew quickly and moved to its present Gothic Revival building along Central Park's eastern boundary in 1880. Since then the building has been renovated and added onto many times. 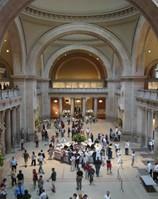 Today, the Metropolitan Museum encompasses over two million square feet of gallery space. The Met was one of the first museums to display the works of Renoir (in 1906)' as well as those of Matisse. The museum's collection also contains five of the forty known canvasses by Vermeer. The Metropolitan Museum's collection is divided into seventeen departments and covers three levels plus a roof-top sculpture garden in the main building and a separate location, The Cloisters, the medieval art galleries located along the Hudson River, seven miles north of the main museum. The most popular galleries are those exhibiting the European Paintings collection - over 2300 paintings by world masters, including Vermeer, Botticelli, Velazquez, and many more. In addition, the museum houses an extensive collection of 19th century European paintings, including many by the Impressionists and 17 Van Goghs. Other highlights of the museum include the authentic, reconstructed Temple of Dendur, an Egyptian temple given to the United States by Egypt in appreciation of their help in constructing the Aswan Dam; a series of period rooms, including an entire Arts and Crafts style room by Frank Lloyd Wright and an authentic 15th century studio from the Ducal Palace in Gubbio, Italy; and over 60,000 Asian art objects - the largest collection of Asian art in the west. Other departments include Drawings and Prints, Islamic Art, European Sculpture and Decorative Arts, and the American Wing - a celebration of 18th to early 20th century American furniture, paintings, sculpture, and design. As with the Louvre Museum in Paris, it is impossible to see everything at the Metropolitan Museum in one day. Visitors are best advised to concentrate on one or two areas or interest. In addition to its permanent collection, the Metropolitan Museum of Art hosts over a dozen special exhibitions each year, bringing together artworks from all other the world. Recent exhibitions have included "Cezanne to Picasso," "Louis Comfort Tiffany and Laurelton Hall," and "Set in Stone: the Spirit of Medieval Sculpture." There is no additional charge for the special exhibitions. The Metropolitan Museum of Art is easily accessible from all around Manhattan and the other four boroughs of New York by bus, subway, or taxi. Parking is available in an underground lot, accessible from behind the museum. The museum is open every day except for Mondays and holidays, from 9:30am to 5pm, with later hours on Friday and Saturday. Admission is $20 for adults and $10 for students and seniors. Children under 12 are admitted free with an adult. Audio guides are available in a number of languages for an additional $7. The Metropolitan offers four dining options for visitors, ranging from the cheerful and efficient ground floor cafeteria to the elegant, full-service, Petrie Court Café, overlooking Central Park. Other facilities include a large gift store and a roof top garden.